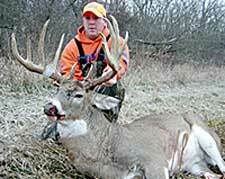 Beau and Tom Carlson of Copper's Creek Outfitters offer trophy whitetail and turkey hunts in Illinois. Located near beautiful Illinois City, in Rock Island and Mercer Counties, Copper's Creek Outfitters offers one of western Illinois' best areas for trophy turkey and monster whitetail. Owners Beau and Tom Carlson provide first-class guided hunts, lodging and great memories to those who want the best out of turkey and deer seasons. Where the Mississippi River turns south and the rolling timbers of western Illinois are only divided by corn, soybean fields, and of course, the hunger and anticipation of harvesting a trophy whitetail slicing through the crisp fall air. It is here, in Rock Island and Mercer Counties, that we have lived and farmed for over 50 years. It is also here that several of the country's largest trophy bucks and boss gobblers, which Illinois is known for, call home. We can put you in place to take big spurs, long beards and trophy deer. We like to say, "We've been planning for next year's hunt for years," meaning that we put in the work to get the game ready for a long time before we took on any hunters. And now we think that we, the whitetails and the turkey are ready! For more information on available dates and price quotes go to the Copper's Creek Outfitters web site below. To book a hunt now call: 309-537-3245, 563-299-9663 or E mail.